Hey all you awesome peeps out there!!!! It's finally nice enough here in Michigan to break out the clothes line and hang out laundry, walk down to the neighbor's goat farm and get fresh eggs, and dig barefoot in the sandbox. Joyful doesn't even begin to describe how I feel about it! Oh, and I think I also picked up a new lawn job today. I love when I don't have to go out looking for work - it just comes and finds me! 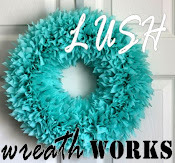 And what's almost equally exciting, Lush Wreath Works is giving Kammy's Korner readers a break on shipping and offering FREE SHIPPING with code FREESHIPKK until May 31st. Folks, that is on any purchase, including clearanced items! Awesome Mother's Day gifts, or even for the guys - there are sport team wreaths for whoever they root for. L-R: my fuzzy feline friends, stenciled top table, piano vignette, and floor reveal! Shall we have a few highlights from last week's party? I'm really excited about this week's Post With The Most, wanna know why? Because this was posted by a very swell friend of mine from out in Iowa. Actually, we traded places. I'm from Iowa, moved to Michigan. She's from Michigan, moved to Iowa. It has something to do with her marrying one of my good pal's, which I may or may not have had something to do with.... ANYWAYZZZZ, is't that an awesome idea for old fence posts? Check it out on The Log Book and welcome her to blogland! I was totally loving how Moments To Remember used black to contrast the window panes. Beautiful! 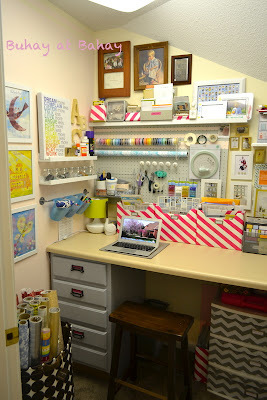 This craft room reveal made me gasp - that's a lot of stuff in... a CLOSET?! You rock, Life & Home On 2102. 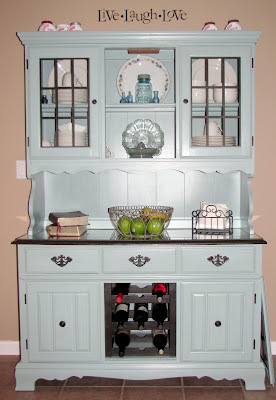 Just love everything about Sunflower Hugs' dresser makeover. 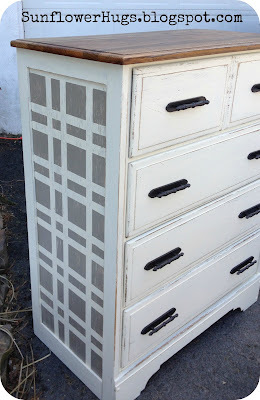 Thank you so much for featuring my cream dresser with fun plaid! Thank you so much for hosting such a lovely party. I am your newest GFC. My first time to your party! Thanks for hosting.